had a lead sabot around it, which would expand into the riflings when fired. These were extremely accurate at any range. Even up to 1000-2000 yards, and longer. This is the smallest Parrott shell used. They also had 20, 30, and even 100 lb Parrott shells. Which could be be lethal for miles. Just like the round exploding cannon balls, these also explode. They use either a timed, percussion, or paper fuse to ignite the explosive substance inside the shell. This shell was dug in Manassas VA. in the early 60’s. It did not explode after being fired. It has a percussion type fuse that did not ignite upon impact. I will be posting a 20 lb Parrott also. I was able to get both of these shells off of a friend of mine who lived and taught in Virginia. He has been a wealth of knowledge to me. 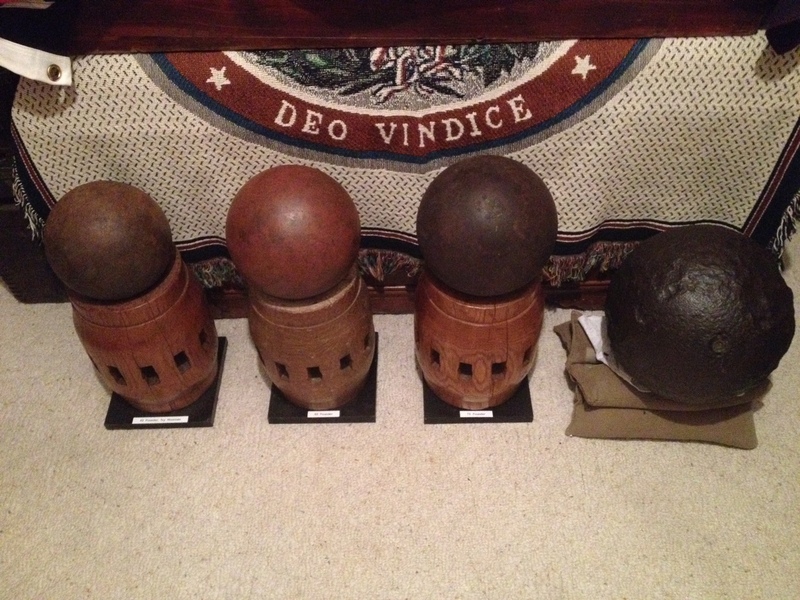 Here is just a photo to show the size difference between the 42, 65, and 75 lb cannonballs, and the 132 lb mortar. From left to right, the 42, 65, and 75 lb rounds are all displayed on old wagon wheel hubs. 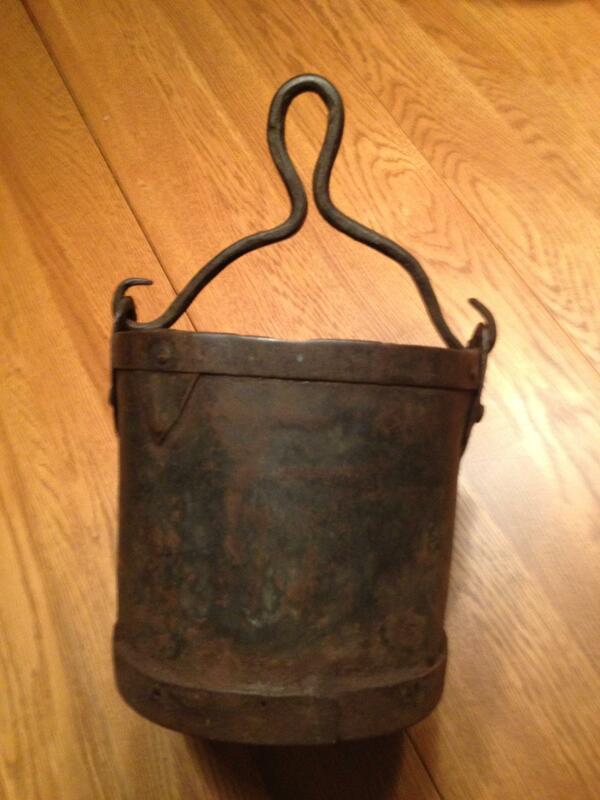 I can’t imagine what it would be like to find something like this while out metal detecting. 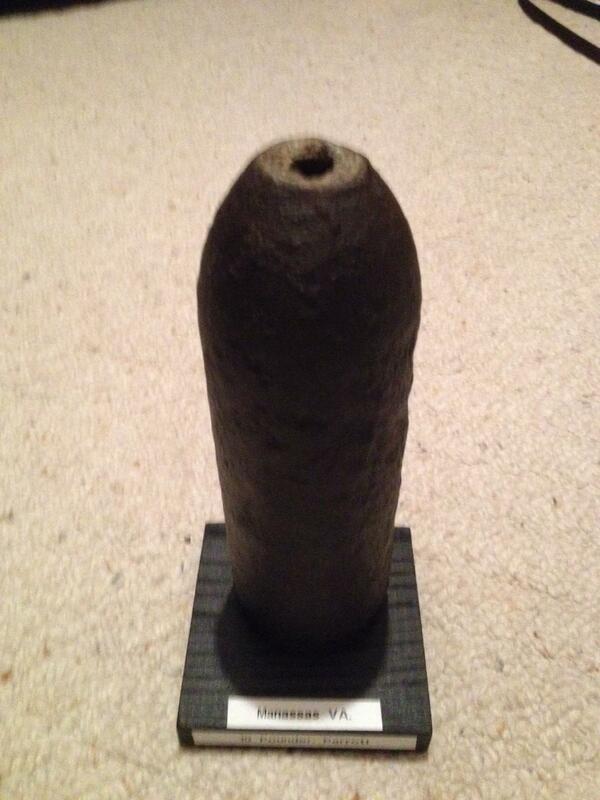 A good friend of mine found this 132 lb mortar round on the banks of the Cumberland River in Nashville Tenn. This type of mortar round would have been shot off of a war ship, and was designed to explode in the air over intrenched troops on land. A closer look shows the wear this round has taken while stuck in the mud of the Cumberland. The plug in the middle of this round is a dated (1862) fuse hole plug. It would have been removed before firing and had a timed fuse screwed into it. This had to have come off of a sunken ship, and over the years made it’s way to the banks. I was so glad to be able to get this for my collection. I great piece of Nashville history. Civil War artifacts can show up just about anywhere. Such is the case with this cannonball. A friend of mine found this one in a pawn shop in Winchester Ky. It is a Union 8 inch 65 lb cannonball. It belonged to the owner of the pawn shop. He had no idea where it came from. Ones this size were used to protect waterways. It is a solid shot ball. While arrowhead hunting on some farmland in Mt. 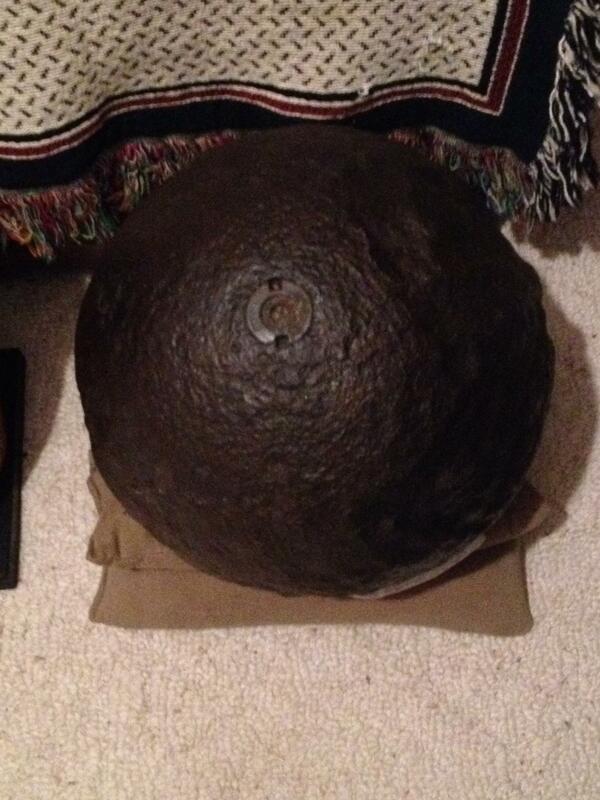 Sterling Ky, a good friend of mine found this Union 12 lb exploding cannonball sitting on top of the dirt. It had been turned up with a plow. This one did not have a fuse in it. Probably fell off of the back of a wagon. Just being at the right place at the right time to find this. It was given to me as a gift. What a great artillery piece to add to my collection. 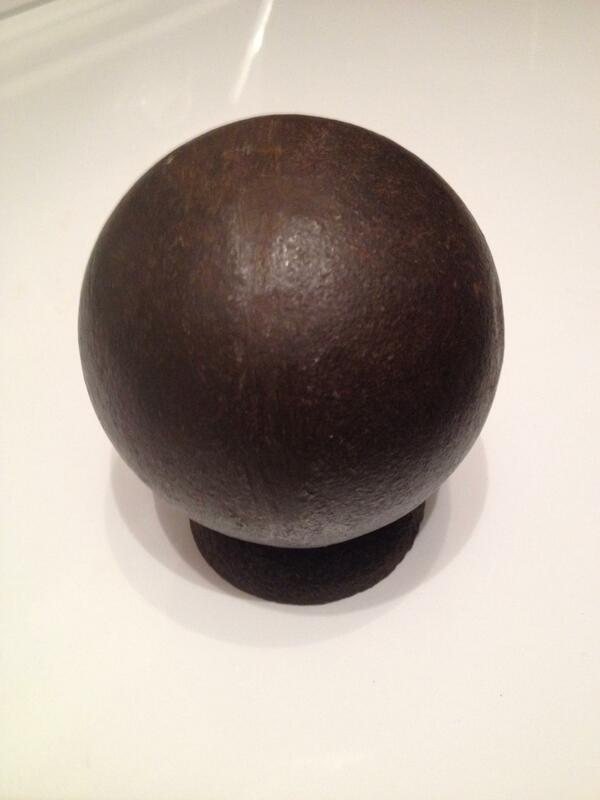 This Union 12 lb cannon ball came from a collection that a friend of mine has had for over 50 years. I will posting more Artillery shells that I was lucky to get from his collection. This is what is called an exploding cannon ball. It was designed to explode in flight after being shot from the cannon. The hole in the top of the cannon ball, like the one shown, is where a timed fuse would be installed. The cannon ball was cast hollow, but later filled with lead balls and a gun powder type filler that would explode when ignited by the fuse. It would be lit when fired from the cannon. But sometimes the fuse would fail, and not ignite the powder. Which is what happened here. This one was dug in Petersburg Va. 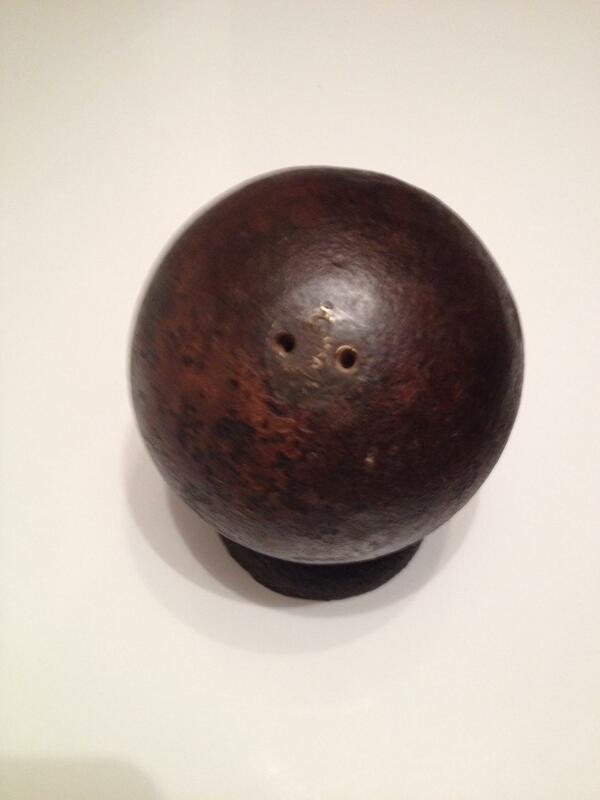 While at a Civil War show in Louisville Ky, a gentleman came into the show wanting to sell this Union 6 lb cannon ball. What a find. It still has the brass plug in it , which would be removed and a timed fuse would be installed before loading it into the cannon to fire. 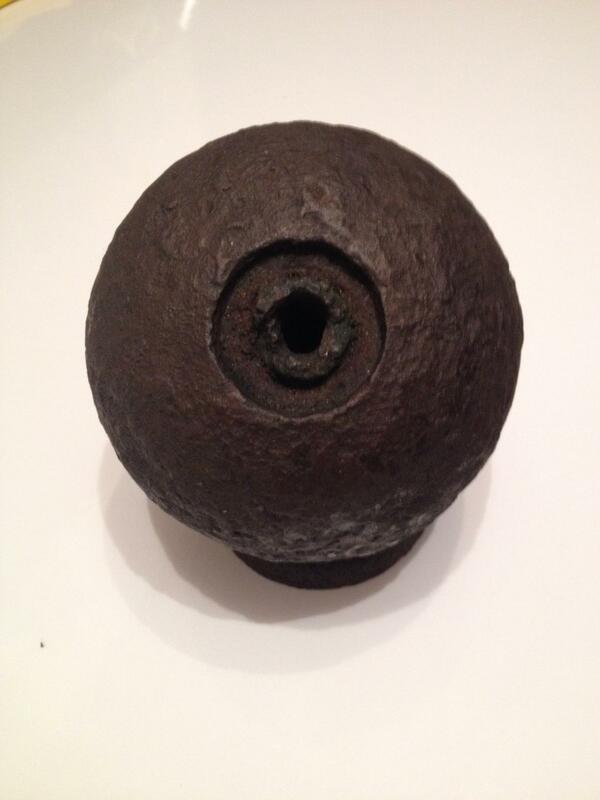 This shell was cast hollow, and would have been filled with lead balls and a gun powder type filler used to explode the shell. Which would have been ignited by the fuse after the ball was fired from the cannon. This is just like the 12 lb cannon ball I have posted. All the gentleman knew was that it was found Ky.
ago, but couldn’t remember where he said his friend had picked it up at. Just knew that it was in Ky. somewhere. 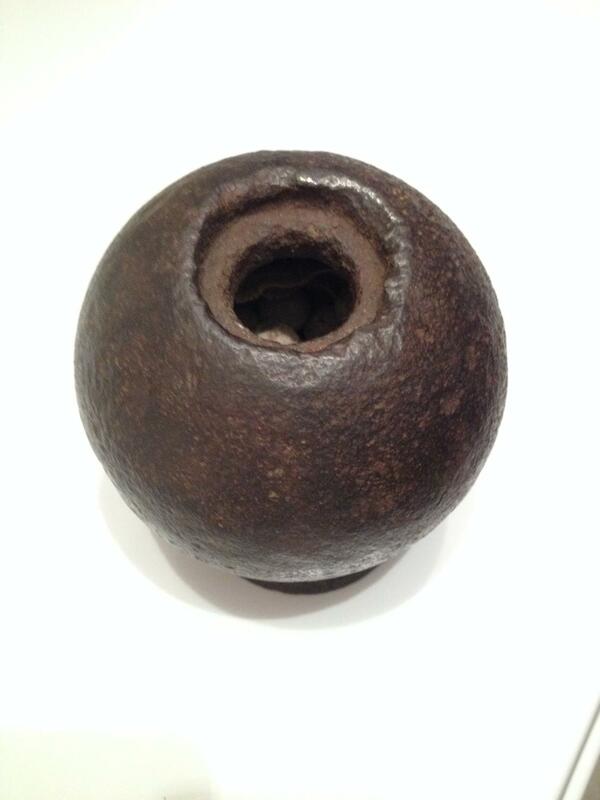 A lot of Confederate cannon balls can be identified by the casting seam that is left in it after it is poured. The casting seam can be seen on the one shown here. It is in the center, from top to the bottom. 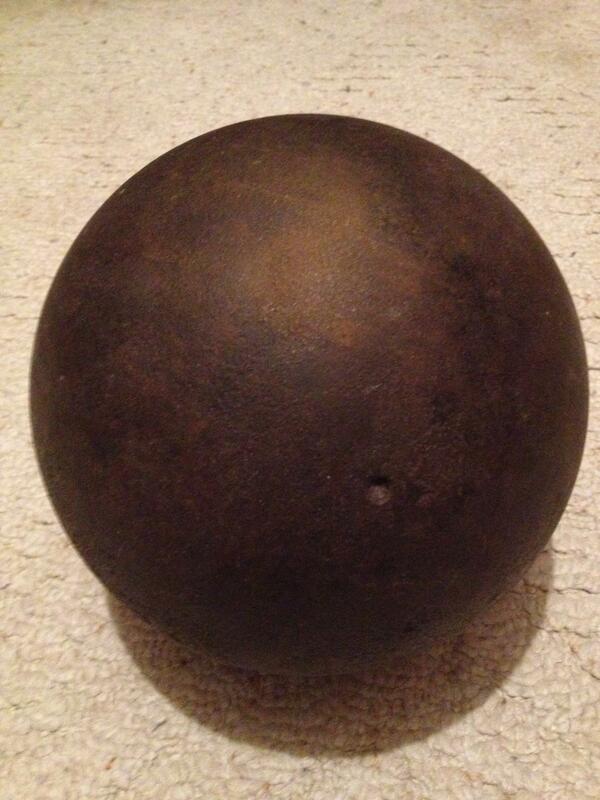 I picked up this cannon ball from a friend of mine who had it for years in his collection. This is the cannon ball that first started my collection. 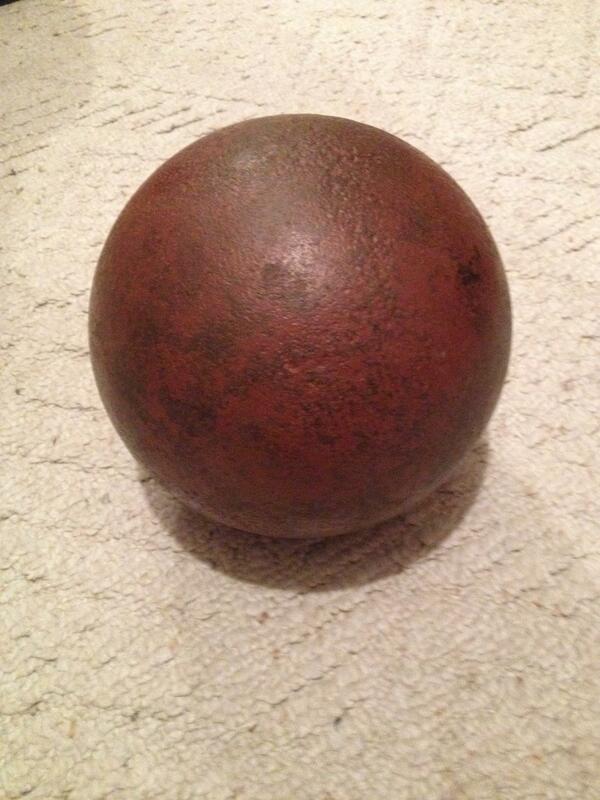 It is 9 inches in diameter, and is a solid shot ball. This size ball would have been shot from a battle or war ship.